Stored Product Pests: Beetles, Weevils and Moths – these pests are very common and also carry dangerous diseases. 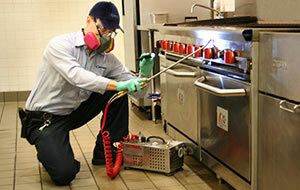 MATRIX Pest Elimination will identify and eliminate these bothersome pests so that your business or home is safe. Stinging Pests: Bees, Wasps, Hornets, and Yellow Jackets – a sting from any of these insects can be painful and ultimately cause serious injury, allergic reaction and even death. MATRIX has “state of the art” solutions, products and methods to eliminate any of these unwelcome pests and keep your business and home safe. Honey Bees are becoming an endangered species. MATRIX Pest Elimination is sensitive to this decline and the importance of bees to our ecosystem. We will work with local Bee Keepers to relocate bee hives and keep them alive and productive. More about bees disappearing here. Call MATRIX to eliminate almost every possible pest infestation.